Foundation grantee Tishreen, working with Na'amat, the Israeli women's group, is providing intensive job-readiness training and support to Arab Israeli women in the Triangle region. The area faces an extraordinarily high unemployment rate. 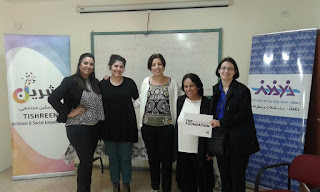 Staff from the two nonprofits, pictured above, are improving the Hebrew language skills of these women, are teaching them how to apply for work, and are bolstering their self-worth.